Orange is just such an Autumnal colour isn’t it?! It’s the colour of the leaves on the trees and covering the pavements, of oranges and mandarins and clementines that really come into their own during the colder months…..and of course fat juicy pumpkins!!!! It’s such a warm, nourishing and delicious colour that when you eat something like a steaming bowl of thick pumpkin soup you feel like you’re being hugged from the inside! 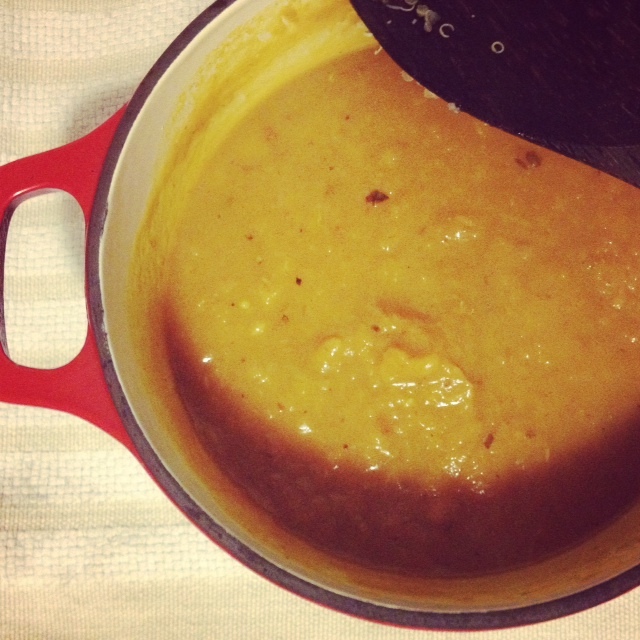 This might sound strange for someone so passionate about pumpkin – but I only made pumpkin soup for the first time last week. Yes, I know, what have I been doing with my life??!! So if you are like I was before last week, a pumpkin soup virgin, then I urge you screw up your courage, buy a pumpkin and follow the very simple instructions below. You’ll be so happy you did! This recipe is super simple as I first made this soup whilst visiting Perth, staying in a house with very limited equipment. There was nothing like a blender available, not even a masher! So I stuck to ingredients I could mash up with a fork. Pumpkin – a whole pumpkin will make enough for 6-8 servings, but it really depends on how big your bowls are, how big the pumpkin is and how big your appetite is! Pre-heat oven to around 200 degrees. Slice up the pumpkin, put on the oven tray along with the garlic cloves and chilli with a dollop of coconut oil, salt and pepper. If using other veggies and / or woody herbs as well add those at this stage too. Cook until the pumpkin and other veggies are soft and easily mashed up (approx 40 mins). Take the skin off the pumpkin and garlic and put in a bowl. Slice the chilli (de-seed if you don’t want it to be too spicy) add that to the bowl. If you have any other veggies or woody herbs, chop them up and add those too. Start mashing! Add your liquid, then continue to mash and add liquid until the soup is at a consistency you like. Pour however much you need into a saucepan to heat up, the rest can either go in the fridge where it should keep for 2-3 days, or put into the freezer. Chop up your coriander and add to the saucepan just before you take it off the heat. Add salt and pepper to taste. Put in a bowl and add a swirl of olive or macadamia nut oil and a dollop of yoghurt.